Summertime is season of fun, and everyone feels patriotic especially around Independence Day. 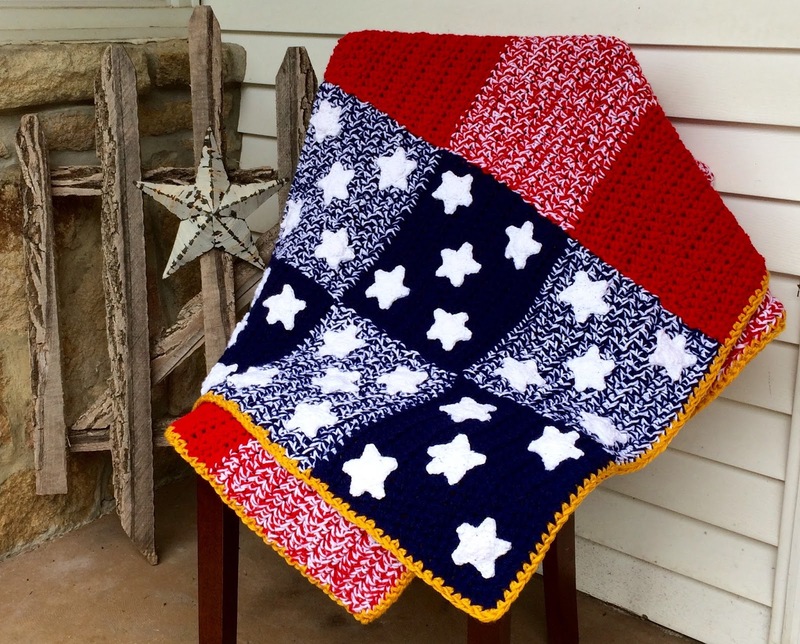 I've designed and created my very first afghan in honor of our nations great flag. I came up with the idea for a patchwork-type flag design before, but I was never able to dedicate time to fully conceptualizing it. Now the time has come! The Patchwork Spangled Banner Afghan was crafted especially for my family reunion coming up in August. It's going to be my contribution to raising funds to support future reunions. I donated my love, time and skill (and of course the yarn!) to be raffled off and won by one lucky member of our family. And of course as a sign of my love for all you happy hookers out there, I've written and published the pattern too! As always, it's FREE for you! 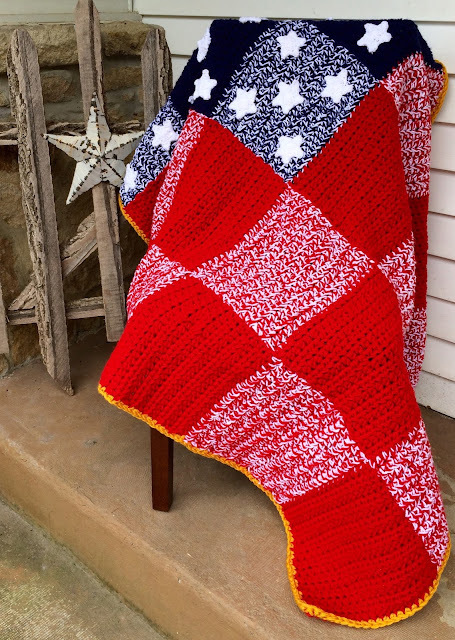 This afghan is crocheted in what I call "strips". Though it appears to be made from 24 individual squares, I actually just change color back and forth in one long continuous strip, horizontally along the blanket. Make four strips and then sew them together to complete the faux flag look! I hope everyone enjoys crocheting their very own fun flag-inspired throw blanket this summer. Please enjoy the pattern and be sure to add it to your Ravelry Queue! I'm available to help with any questions, as you begin your project! Please leave me a comment and let me know what you think of this pattern! A portable, clean viewing, printer friendly PDF download is available now in my Etsy shop! Click Here to Get the PDF from Etsy or from my Ravelry Shop! Thank you for supporting more free content from Haute Kippy for your enjoyment! Afghan is crocheted with two strands held together, one from each of two skeins in varying colors. In order to crochet with 2 strands on the gold skein, use both the inner and outer strands held together, unwinding simultaneously. Constructed in horizontal strips containing blocks of 20 sts by 15 rows, changing one strand’s color after 15 rows and continuing on for a total of four strips, each with six- 20x15 blocks. The four strips are then sewn together. Color changes are made in the last stitch of the 15th row of each color block as follows: in the last st of row 15, yo, draw up a loop, drop old color(s) keeping loops already on hook, pick up new color(s), yo and draw through loops on hook. Cut dropped color(s) leaving a tail long enough to weave in. There will be many tails to weave in as afghan progresses through color changes, it is recommended to weave-as-you-go, pausing to weave after the first two or three rows of the next color block of the strip. Edging in gold is optional, as some fancy American flags have gold fringe, and even tassels as a decoration. This also helps to seal side edges for a more finished look. 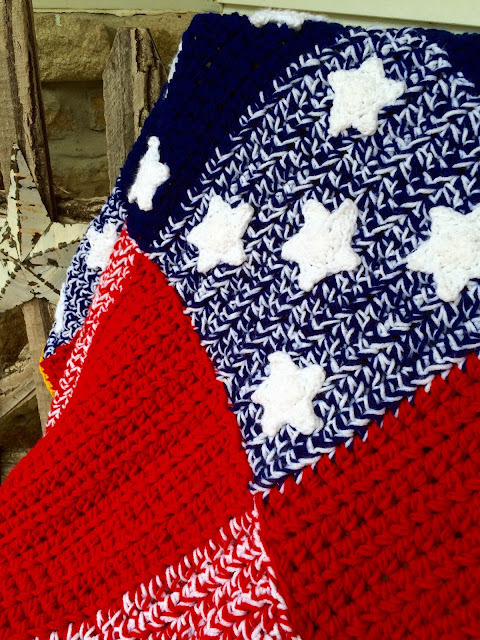 Stars are individually crocheted appliques, hand-sewn onto the starfield of the “flag”. and denotes their corresponding color combinations. Chain 21 using 2 strands of blue held together. Rows 3-14: repeat row 2. Row 15: hdc into each st across, at last st, drop 1 strand of blue, add 1 strand of white, ch 1, turn. Continue on, making one long strip through all color block changes. See #3 in notes for details about color changes. Refer back to color chart for help in understanding color block pattern. Repeat rows 1-14 using white and blue held together. Row 15: hdc into each st across, at last st, drop white, add 1 strand of blue, ch 1, turn. Repeat rows 1-14 using 2 strands of blue held together. Row 15: hdc into each st across, at last st, drop both blue strands, add 1 strand of white and 1 strand of red, ch 1, turn. Repeat rows 1-14 using white and red held together. Row 15: hdc into each st across, at last st, drop white, add 1 strand of red, ch 1, turn. Repeat rows 1-14 using 2 strands of red held together. Row 15: hdc into each st across, at last st, drop 1 strand of red, add 1 strand of white, ch 1, turn. Row 15: hdc into each st across (20 sts), fo, weave in ends. Chain 21 using 1 strand of blue and 1 strand of white held together. Repeat rows 1-14 using 1 strand of blue and 1 strand of white held together. Row 15: hdc into each st across, at last st, drop blue and white, add 2 strands of red, ch 1, turn. Repeat rows 1-14 using 1 strand of red and 1 strand of white held together. Chain 21 using 2 strands of red held together. Chain 21 using 1 strand of red and 1 strand of white held together. Arrange strips in order from 1 to 4 as reflected by the chart. Sew strips together using red yarn. Avoid a common whip stitch, instead make small stitches on the sides of the strip, weaving the needle back and forth between the strips and pulling them together. This will prevent any obvious seams. Round 1: Ch 2, make 10 dc into magic ring, sl st to first dc to join, pull loop tightly closed. Round 2: Ch 4, being sure to stitch into the back bump of the chain, *sc into the second ch from hook, hdc into the next ch, dc into the final ch, sk the next st from the previous row of dc’s and sl st into the next st* (point of star made), ch 4, *repeat* four more times, sl st into the last st, fo, leaving a long tail (~12”) for sewing. Sew stars to afghan, 5 to a block positioning them as follows: one in each corner, and one in the middle. Be sure to sew securely, especially the points of the stars. Take care not to let the white of the sewing tail bleed through to opposite side of afghan. Size stars up or down for desired effect by changing hook or yarn. Using 2 strands of gold held together, join to one edge on right side of afghan and sc evenly around entire edge, making 2 sc in corner sts. Raw edge rule of thumb is apx. 3 sts over every 2 rows of hdc. Fo, weave in ends. 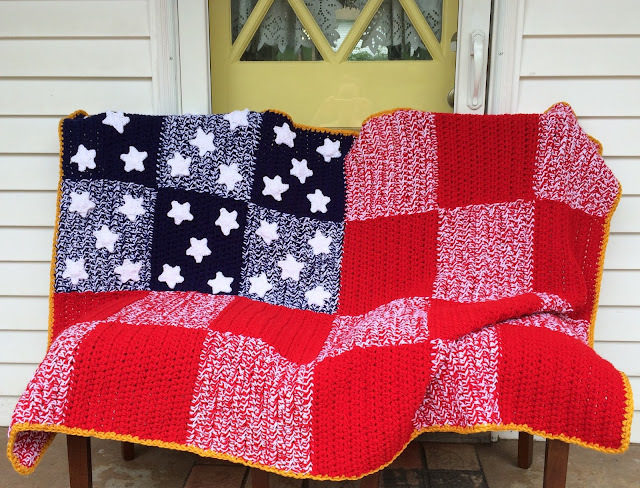 Awesome, shared on our page Awesome Crocheted Afghans!!!!! Wonderful awesome & THANK YOU!!! I'm so glad to hear that! 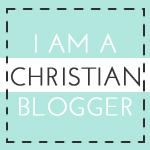 Thank you very much for sharing my post and pattern! 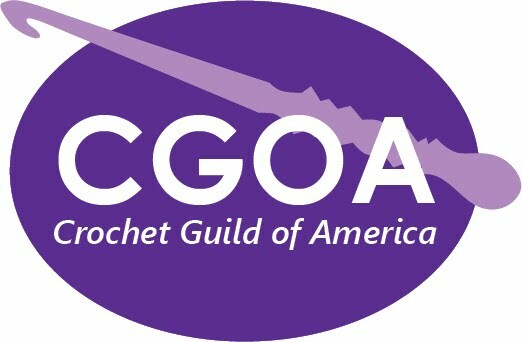 It is my pleasure to make and share quality free crochet patterns! Thank you for your compliment, and you are so welcome! Happy Independence Day to you as well! God Bless America! Thank you for your kind words!